So I rolled over and went back to sleep. But only for a few minutes. By 8:30am I was up and on my way. I breakfasted and showered and packed my bags. I’m not going home until tomorrow, but since a third night is not technically necessary for the recruiting gig, everything here on out would be on my own dime and not the firm’s — which meant I needed to move to a more economical hotel. Fortunately the new hotel was willing to let me check in early; I dropped my bags and headed out. First stop? 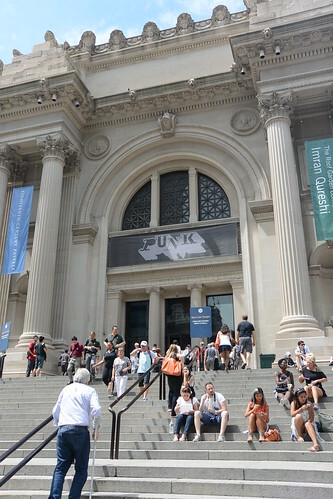 The Metropolitan Museum of Art. 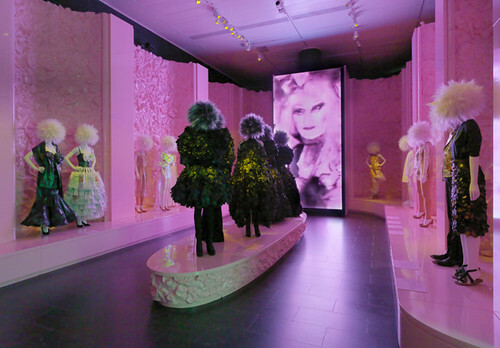 Every year the Fashion Institute puts on at least one big fashion-related exhibition at the Met, and they’re inevitably fascinating. Their exhibition from a few years ago — featuring 18th Century French fashion and decorative arts — remains the best museum exhibit I’ve ever seen, and I always go out of my way to see the new exhibitions. 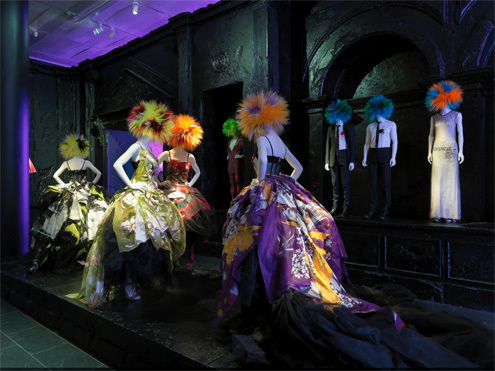 This year’s theme was “PUNK: Chaos to Couture,” and it was awesome. 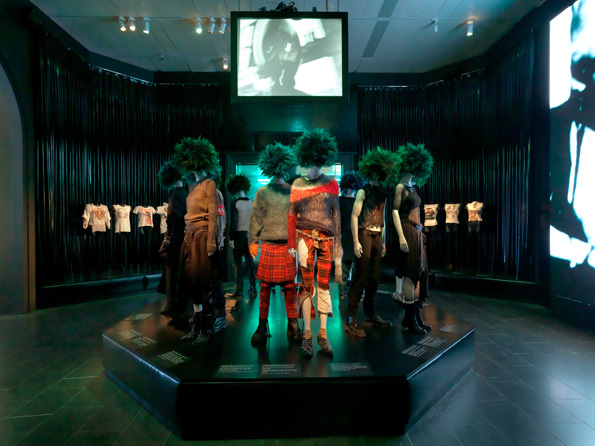 The goal of the show was to explore the relationship between the punk movement and aesthetic and high fashion. More specifically, it focused on the “do it yourself” ethos of punk (think slashed clothing, safety-pins, etc.) and the “made to measure” concept of haute couture. I’m not going to lie — much of the clothing was (to me) hideous. But I guess that’s kind of the point: Punk was all about turning clothing and style into something that was aggressive and subversive. 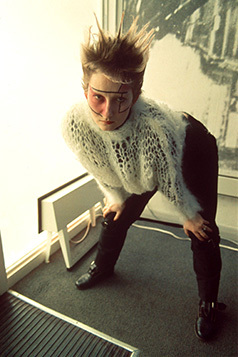 What I loved, though, was seeing how the couture designers adopted the punk vernacular into their high fashion creations. I mean, these clothes — mostly dresses for women, but a fair amount of men’s clothes, too — combined that aggressive expression with the most exquisite craftsmanship, with stunning results. Not all of the clothing was ugly, though. The highlight, by far, were three dresses by Alexander McQueen. The fabric intentionally resembled black trash bags and bubble wrap, but they were breathtakingly beautiful. It’s hard to describe the feeling they inspired — I just stood there smiling, delighted. McQueen was clearly a genius. The McQueen dresses were just to the left of this shot. I tried to take a picture but got yelled at — apparently photos are not allowed in special exhibitions; I’ve pulled all the photos here from the Met’s website. Photography isn’t prohibited everywhere in the Met, though. After I’d seen the PUNK exhibition, I stumbled upon a smaller exhibition focusing on artwork and interior design. Apparently the concept of interior design — decorating a room with a coherent design aesthetic — didn’t really exhist until the 15th/16th centuries. 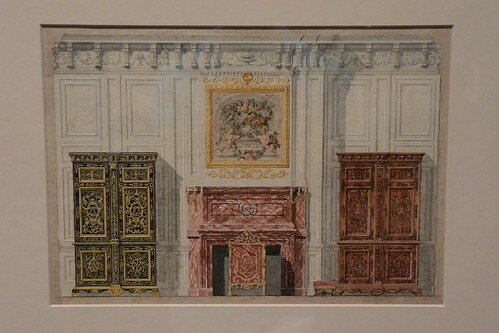 The exhibition contained drawings made by architects and designers for rooms and furniture. ago, and I’m reading it again right now — I just finished the “Fireplaces” section. There’s only so much museum-going I can take, though, before I get hungry. The Upper East Side — where the Met is located — is a lovely residential area, but it’s kind of a wasteland for restaurants. 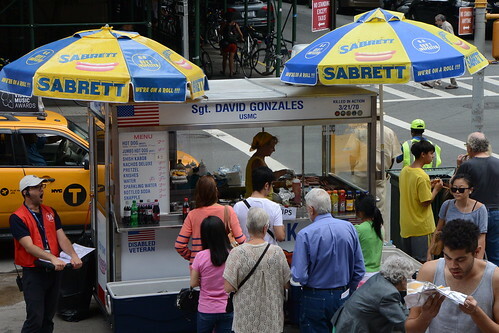 Fortunately, there’s a string of hot dog stands on the sidewalk at the base of the steps leading up to the Met. I never noticed before today that the carts are all dedicated to Marines killed in Vietnam. 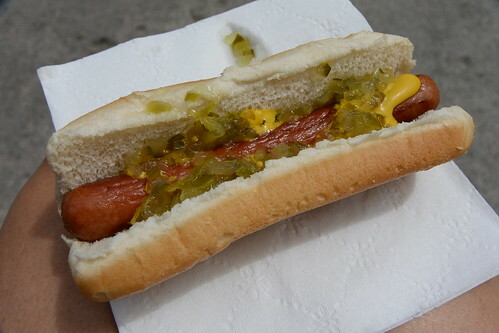 Hot dogs, properly understood, are really just vehicles for mustard and relish. 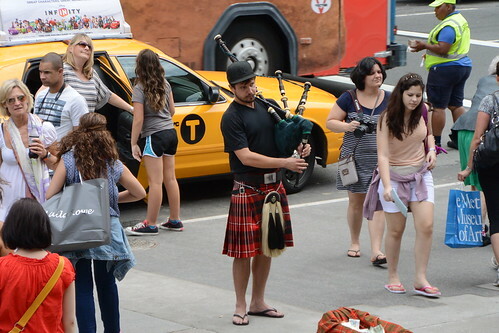 A kilt and flip-flops…classy! Some of the things I miss living in the middle of freaky-Friday nowhere are things like art galleries, and theaters with good shows and music and just general civilization. I think I'm going to curse J. Robert Oppenheimer for putting the lab in the middle of New Mexico…sigh. ← In which Jean Valjean doesn’t sing, but Rory does.